Remembering the geometric mean relationships can be difficult. Select the check box "Point A." 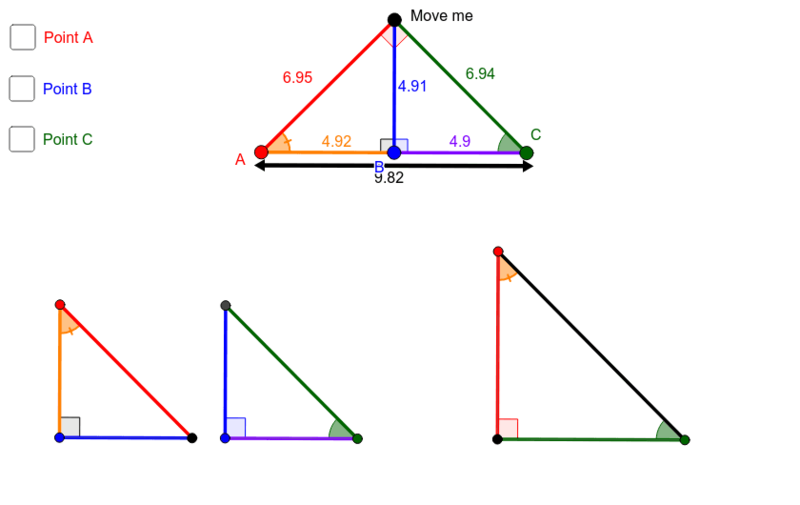 Notice that the 3 segments in this geometric mean relationship intersect at A. The corresponding segments of the similar triangles that create this relationship are highlighted below. Select the check box "Point B." Notice that the 3 segments in this geometric mean relationship intersect at B. The corresponding segments of the similar triangles that create this relationship are highlighted below. Select the check box "Point C." Notice that the 3 segments in this geometric mean relationship intersect at C. The corresponding segments of the similar triangles that create this relationship are highlighted below.